My program feels like a good fit. So far, I’ve enjoyed working with Humanities Kansas. Earlier this year I did the show in Goodland and Oakley, Kansas, for two very different audiences. The backdrop to my storytelling at the Goodland Public LIbrary. In Lawrence I live a half block from the train tracks, so I felt right at home. In Goodland, I had an evening performance for about twelve women. I told a mixture of Grimm tales, from the truly gruesome Juniper tree to the story Cat and mouse, which I also tell to children (though it has a bad end for the mouse), along with other tales. I talked about the Grimms themselves and why they collected stories, how they edited them, what was happening in the world at the time, and more. Discussion was lively, veering off into the art of storytelling in general. It was great fun! In Oakley, the performance was in the afternoon. Along with the crowd of older folks, there was a group of high school students, mostly boys. These kids came a little early, so I told an extra story. It’s vitally important to engage kids immediately, or they’ll check out. Hmm, that goes for everybody, but adults are better at hiding boredom. At any rate, I told them a gruesome English folktale, Mr. Fox, a version of Bluebeard. During the program itself, I told a Grimm version of the same story, The fitcher’s bird, as well as the stories I told in Goodland. As in Goodland, the Oakley audience listened intently. They had lots of comments and questions about the lecture material. Our discussion ranged widely, and included two of the students telling short scary stories. When we talked about storytelling, I mentioned The ghost with the one black eye, the story for children I’m best known for. One of the adults called out, “Tell it!” After checking with the teachers that I could keep the kids past the hour, I did. A student raised his hand and said, “My mom used to play us a cassette with that story.” He recognized my voice., too. I put that cassette out in 1996! After the performance, the librarian served gingerbread and apple slices, shades of Hansel and Gretel, Snow White and The Juniper Tree! The whole experience was excellent. I’m looking forward to presenting Grimm for growunups later this year in Coffeyville, Wichita and Dodge City, and I hope elsewhere. For more info on booking this program, check out the Humanities Kansas Speakers Bureau. Peeps was a surprise. I had no intention of buying a new puppet when I wandered into the Toy Store about eight years ago, on a break between performances at the Lawrence Arts Center. He jumped onto my hand and there we were. At first, I called him Peep, but in that first performance I called him "Peepee" by mistake. Peeps is much better. He's young, just out of his shell. In fact, when I bring him out of the puppet bag, he's all the way inside the shell, scared. I coax him out. I love how quiet the audience is with the anticipation as his head appears slowly. If they aren't quiet, he goes back in the shell. Peeps has a problem, though. He's always hungry. The audience throws him worms, until he has so many that, HIC! he gets the hiccups. Then we try to get rid of them. The listeners suggest remedies. They don't work, usually, until someone (sometimes it's me) suggests peanut butter or a spoonful of sugar. Those always work. After that, Peeps is tired again, so he goes back into the puppet bag for his nap and we go on with the show. The children at Everest Masculino school drew pictures of the performance, including this portrait of Peeps. I love the line from Theodore Roethke's poem, The waking: "I learn by going where I have to go." I often don't know where I'm going until I set out. In renovating my house, I froze in the face of the massive project. I couldn't do anything for days, despite friends and family offering to help me organize the project. Then my dear sister-in-law Kate suggested I just prime one room. Once I began, I saw that I could continue. I learned by going where I had to go. Starting is what moves me along. One coat of primer moved me to choose the final color, which pushed me in the direction of the trim, which led me to blinds and curtains, and so on. So it is with stories. I often need to start in order to know where I'm going. Like my house, stories are also never finished. I'm always shifting my telling to the audience or even to who I am at the moment. Sometimes starting out is, as Donald Davis recommends, just telling about the story. Sometimes it is a small piece of research that awakens my curiosity. With every new story, as with every house project, I learn to trust that whatever comes out will be fine. Or if it isn't, I can make a new plan, change the story, change the design, just keep creating as I go along. Imagine this: students in five schools in different parts of the world listening to one storyteller (me) in their own classrooms, and asking the storyteller questions via chat. I'm in my studio (otherwise known as my dining room). The stories are tailored to the audience. The schools pay a fraction of the price of a regular storytelling performance, with none of the travel fees. They can use smartboards, projectors or individual screens. The teacher clicks a link and they're in the session. Make sure the cat is outside before beginning. He is charming, but a distraction. Use a wired connection, not wireless, for the strongest possible signal. Put a "Do Not Disturb" sign on the door. Don't use a lot of fast hand gestures. Movement on a screen can get blurred. Dim the brightness of the laptop screen for less glare on eyeglasses. Plan for extra time for questions, since it requires using the chat window. I still prefer telling stories in person, but this is a great way to get more stories and workshops out into the world. I'm ready to go live, er, live-ish. Soon look for pricing on my website for full performances, workshops and "story snacks" (5-10 minute mini sessions). Have questions? E-mail me or put a comment below. Alas, I have a headcold. I work hard to stay healthy, especially on international tours, but sometimes I succumb to germs. A couple of weeks before I leave for an overseas trip, I start taking echinacea and goldenseal, to boost my immune system. I also take Vitamin D. I pack these, along with multivitamins, ibuprofen, Pepto-Bismol, anti-diarrheal pills, night-time and day-time cold medicine, sinus rinse packs and my neti pot, bandaids, antibiotic ointment, tweezers, Tiger balm and zinc lozenges. On top of this pharmacopeia, I drink lots of water. Lots of water. This is the best way to keep my voice in shape, along with vocal warm-up exercises before performances. If I feel throat irritation, I buy lozenges at local pharmacies and health food stores. I'm partial to those made with propolis and honey. I also buy ginger, lemon and honey, which I simmer to make a soothing drink. It's good hot or cold. I find out if the country I'm going to has safe water. If not, I drink bottled or boiled water only. Yes, I have Pepto-bismol, but if I'm careful, I may not need it. I try to wash my hands frequently. I tend to forget hand sanitizer, maybe because I don't like the way it feels. Maybe if I'd used it, I wouldn't have gotten this particular cold. Then again, it wouldn't have stopped the person sneezing and coughing on me on the airplane on the way to Costa Rica. At the first sign of a cold, I take zinc lozenges. Sometimes they can keep a cold at bay. Or at least that's what I tell myself. Warning: don't take them on an empty stomach. They can make you feel nauseous. I do that revolting sinus rinse a couple of times a day so a simple cold doesn't turn into a sinus infection. I've been lucky not to lose my voice on these tours--the only thing you can do in that case is not talk. Yikes! After a day of work, usually four performances, I take a nap. I like to get a walk in at some point. I also go to bed early--it's important to save my energy for the school sessions. Oh, yes, and that's sunscreen in the picture. In Ecuador especially the sun is strong. Sunscreen is essential. Wear it. I know it's a cliche but it's true: people live on through the stories we tell about them. I'm writing this two days before my mother's funeral. My mother, Carol Edgelow Howe, grew up in Springfield, Massachusetts. She and her three sisters often visited their grandparents in Westmount, Quebec. One Christmas, when she was about three, she was put to bed while her parents and grandparents ate supper. Little Carol was certain that Santa Claus was down the street by the corner. She got out of bed and left the house alone on that snowy night. The family dog, a Newfoundland named Caesar, followed, then got in front of her. He pushed her back up the steps of the house. She was furious with him! How dare he keep her from Santa Claus! Maybe that visit? Mom was headstrong, even at that age. Mom had a powerful imagination, a lively mind and a wicked sense of humor. She graduated from Wellesley College in 1945, though the story is that the Dean had to call her father to discuss my mother's errant ways--reading novels rather than her assignments and dating boys. She was a looker! I suspect she was a big daydreamer. In her later years, after my father died, we discovered that it was also Mom who was the dawdler. When I was in school, she was insistent that we not be late. I found some of her grammar school report cards and discovered that in fourth grade, she was late dozens of times! After working at a florist shop and a nursery, as well as a lifetime of gardening and raising houseplants (her Cattleya orchids were always in bloom), Mom wrote garden columns for newspapers for forty years. Her last column was in September 2016 at age 93. Whenever I asked her for gardening advice, she always gave the same answer: "Why don't you call your Extension Agent?" Mom was deeply invested in her church, St. Columba's in Boothbay Harbor, Maine and involved in the church's mission in Belém, Brazil. Not surprising, as my father was an Episcopal priest. My parents, early in their marriage. Mom was concerned with issues of hunger and poverty. When she went to church, she always brought at least one can of food for the pantry. In her gardening articles, she suggested people "plant a row for the hungry," an initiative of the Garden Writers of America. Mom loved to spend time outdoors, to sing, to read--she belonged to two book clubs in Maine, where she spent the last thirty years of her life, until last October when we moved her to Kansas to be near three of her seven children. We moved Mom to Lawrence, Kansas because none of us was close enough to Maine to help in an emergency. This proved to be prescient. In late February, she had a stroke. She'd been in assisted living, but moved into long-term care with hospice. All of her children were able to come to Kansas to say goodbye. We had the luxury of nine weeks with her after her stroke. My in-town siblings, Mary and Thomas, their spouses, and I spent time with her every day. She loved visits from my siblings' dogs, too. The stroke took a bit of her short-term memory and her ability to process writing, but Mom did not have dementia. She was aware and coherent for the few hours each day she was awake. She loved hearing e-mails and cards from family and friends. We read to her, brought her flowers from our gardens, fed her and advocated for her. We even had cocktail hour with her a few times. After the first one she told the nurse that she'd had almost a whole beer. Well, actually, she had three small sips and a couple of goldfish crackers. In March, I wrote a blog post about storytelling as a respite. Now you know why. Mom died with a slight smile on her lips on Sunday, April 30, 2017 at 11:50 a.m. My sister Mary and I were at her side. RIP Carol Edgelow Howe, 1923-2017. If you feel so inclined, plant a row for the hungry or take some nonperishables to your local food pantry in her honor. Baby is the one on the left. Baby came to me from Molly, who beginning at the tender age of three was a fan of my puppet Trixie. Once she invited Trixie over for a sleepover. I was not invited. When Trixie hesitated, Molly suggested maybe just a playdate. When Molly was about ten, she got her own puppet, Baby. Alas, Baby wasn't as engaging as Trixie. Molly's mother Stacey called me to say that Molly would like to give me a present. As soon as I put Baby on my hand, I knew we were a good match. The combination of the old-man look, the wide blue eyes and the binky (a.k.a. pacifier, a.k.a. dummy, a.k.a. passy) are irresistible. The binky is what pulls most listeners in. Baby pops it out, even when she says she won't. Usually it's a resounding "pop!" but sometimes it's more like a raspberry. Even after I put her back in the bag, after she has vanished from sight, the listeners hear the passy pop. Baby doesn't have another name. She's content to be like Cher or Madonna. Baby. She has many activities in the puppet bag: playing poker, making up ridiculous songs, eating tuna fish sandwiches. She prefers that Trixie not sit on her head, as that is not a good way to babysit. Oh, and Baby has a new binky as of last summer. It is, as she says, "Only for special, not for every day." Baby keeps this special pacifier in the pocket of the puppet bag. It's her Super Mario binky or her Groucho binky, and when it's upside down, it's a soul patch. It pops out of her mouth just as well as the regular binky. Thanks, Molly, for this amazing character! My friend Kareen King prompted me to choose a theme for the year, a word to focus on. Almost immediately, it came to me: "community." In truth, I've been thinking about this word for a little over a year, since I moved back from KC to Lawrence. I moved back mostly because I missed my community. I live on the same street I moved from in 2010, just a half block east. I'm close enough to downtown that I can walk and often when I do, I run into friends. How can my storytelling add to this community? One way is through the Story Nights I do in the backyard. I had five last summer and will do more this next year. My cat Frankie even attended! I'm also thinking about how the stories we tell can build up or tear down a community. I want to tell the stories that build up community. Sometimes that's through shared laughter, sometimes it's through specific ideas the listeners get from the stories. Last week I told Grandmother Bear and the Hurtful Words to a group of 2nd graders. We talked about what one might say after using hurtful words. I explained that "just kidding" isn't kind. One little girl raised her hand and said, "But what if you were really just kidding." That gave me pause. I suggested that it might not be a good way to kid, because it could truly hurt somebody's feelings. Sometimes the stories we tell can encourage kindness in a world that doesn't always feel kind. The freshly plastered yellow wall, freshly painted trim and green wall of my office, thanks to Kate, Tim, Samrat, Mary, Andy, Marie, Paul and Janelle. The freshly plastered dining room, thanks to Thomas, Kate, Tony and his guys, Sarah, Mark, Tim. The painted living room, thanks to Kate, Paul and Anthea. The bedroom, with help from Kate and Deborah. The puppet room (they're just out of sight)--oh, I did this room myself. And most recently, the bright and clean kitchen, thanks to Kate, Thomas, Paul, Marie, Robin, Susan, Bonnie, Aaron, Jamie, Diane and Tim. I had immeasurable help also from Mary, Rick, Mary W., Andy, Jeanette, Mike, Bob, Kareen, Tzveta, Marie G., Joanna-banana, Dave, Steve, Tom O., Sarah, Joyce and all of you who listened to me drone on and on about the house. I hope I haven't left anyone out. * Thank you all. You matter. WE matter. Community matters. *I also had professional help from Earl Moise of Rising Son Plumbing, Jeff Hardie of Electric Plus, Andy Martin of Martin Hardwood Floors and Tony Backus. They all did a great job! I had a great time telling stories in China. Most of the performances were tremendous fun. Generally, the level of English was quite good and the students were engaged. The teachers and administrators were easy to work with, often going out of their way to make sure I was comfortable. I love these tours, even with the intense schedule of 64 performances in four weeks (four per day, four days a week). I was in eight schools in five cities: Beijing, Shanghai, Suzhou, Wuxi and Ningbo. On my last day, I performed at a preschool, in a cute little theater. Notice my booties? They take great care of the floors, so kids wear only-indoor shoes and guests don these maroon lovelies. I had a workshop for the teachers at the preschool. Here, we're playing a circle game, "Thorn Rosa,". I almost always show the map of the US while telling the students where I'm from and where my siblings live. This gets them used to my voice before the stories begin. It also makes them laugh, since there are seven of us (a much larger family than is found in China). This group of young children in Ningbo was delightful. We carried the DreamOn banner with us to all the schools. At one school, in the Q & A, a child asked who the boy on the banner is. I don't know! Some groups were quite large. This one was local stream, that is Chinese students with no international kids. At most schools, I had either international stream or mixed. Even the big kids liked the baby. It's a pleasure for me to see kids enjoying the stories. One of the things I love about travel is the unexpected encounters with people. Today I had a day off in the city of Ningbo. My substitute tour manager Fiona and I were strolling through a garden after lunch when we heard music. Turned out to be a group of older folks singing in a pagoda. We peeked in. They were startled and pleased to see a, gasp, foreigner enjoying their tunes. I asked Fiona to ask if I could take pictures. Of course! And they wanted pictures with me as well. We took several, inside and outside the pagoda. There was a lot of interested chatter as Fiona told them where I was from. They smiled and patted me, making sure I was right in the middle of the pictures. I think we all found this encounter highly entertaining and satisfying. I had another good one on Monday, in the train station in Wuxi on the way back to Shanghai. I'm three weeks into the China tour, so maybe it's time to write about the schools. I've been having a fantastic time at all of them! First, let me answer two questions I am often asked: what language am I using? Do I have an interpreter? I am telling stories in English. The tours with DreamOn are focused on telling stories to students who are learning English as a second language and ex-pat kids. I do not have an interpreter, though I have a tour manager to help me outside of the shows (and sometimes during them). I perform for everybody from preschool to high school. This preschooler has just put her shoes back on after the performance. In the primary school at the Suzhou Singapore International School, children take their shoes off before entering the library. 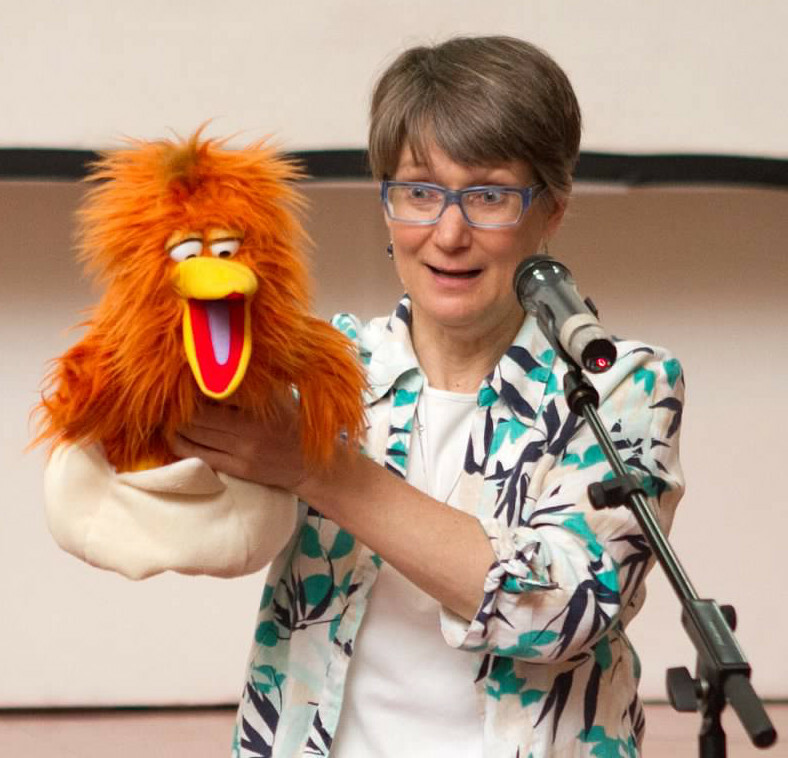 Like at home, when I perform for preschoolers and elementary school children, I use my puppets. They are essential when the students understand less English. Everybody understands when Trixie brushes her hair with her toothbrush. Everybody understands when the baby pops her binky out of her mouth. It's more of a challenge when the students are in middle school but have limited English. Even the big kids love the baby puppet. I've been at four schools so far: two in Beijing, one in Shanghai and one in Suzhou. The performances have been in the library and in the auditorium. Alberto and I with BIBA librarian Stoyana Popovska. She, like the other librarians I've met here, is a fantastic librarian, committed to encouraging kids to read. The BIBA library is lovely, full of color and light. The SSIS elementary library has lovely murals. There are different language collections in the library, to suit the different nationalities. I wasn't the only one sharing stories. At lunchtime, the Head of School at Suzhou Singapore International School and other dignitaries read to the kids in the library. Given my druthers, I prefer the library. In Shanghai, though, Shanghai United International School had a new auditorium. I was the first performer there, so the kids were hugely excited to be in the hall. Before the show at SUIS. I had some challenges here. The little children were really too small for the seats, and trickier still, the armrests held desks. Alberto made a genius suggestion, which was to ask the kids to take those desks out at the very beginning of each program, then put them away and NEVER TOUCH THEM AGAIN. This worked. Children are naturally curious, so this was a way to satisfy their curiosity without it being a big deal. I also have to show kids my crooked little fingers before I begin, for the same reason. If I don't they get distracted by my hands and forget to listen to the stories. For the most part, the audiences have been wonderful. They've joined in nicely and at the end have asked good questions. The teachers and librarians have been welcoming. I've felt that many of them would go out for coffee with me if we lived near each other. I have a week left, with a tough schedule: four days of work in four schools, each in a different city. No complaints, though. I signed up for this adventure and am eating it up with a spoon! The Chinese kind of spoon, as in the next picture. The spoon is upside down in this delicious smoky eel dish. I just couldn't resist adding a food picture to this post! My school work didn't begin until Tuesday of my first week in China. On Monday, Alberto and I went to a Beijing "snack street," to check out some delicacies. Starfish on a stick, anybody? These scorpions were still alive. Not for me, thank you. Little birdies. Speaking of birdies, I've seen people in public park batting around badminton birdies. I'm not certain what is in this pineapple. Possibly red rice. Oddly enough, I didn't take pictures of the delicious fried dumplings and the sesame brittle I ate. I wasn't terribly adventurous on snack street, though I was completely fascinated by the selection.